Starlight traveller mug is made of Stainless Steel. Double walled with vacuum insulation. Holds up to 350 ml. (12 oz.). 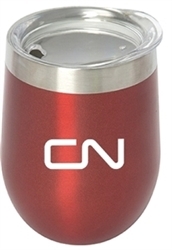 Glitter matte exterior finish with silver trim and clear Acrylic push on lid with sipper hole for hot or cold beverages. Individually boxed.